Utterly beautiful Provence ticks the boxes for an idyllic vacation destination; stunning landscapes, gorgeous lavender off-set against the endless rows of luscious vines, the fantastic Mediterranean climate and sumptuous wines, scattered with striking Roman heritage. The oldest wine producing region in France, with a history dating back over 2600 years, although still not high on the connoisseur’s list. Most probably down to the fact that almost 90% of the wine produced is Rosé, this tradition dating back as far as 2BC when the fame of the “pink” wine resulting from the rapid processing of red grapes spread across the Roman Empire. Reds and whites are produced, in fact, there are over 35 grape varieties permitted in the region. The styles vary as does the incredible geographic diversity across the 9 appellations. One common factor throughout this vast region is, however, the optimum ripening conditions thanks to loads of sun, low rainfall and the famous “mistral winds” cooling the vines and helping keep the disease at bay. Wild shrubs of rosemary, lavender, juniper, and thyme thrive here and are without a doubt essential in influencing the resulting wines. We, Cellar Tours will prepare a personalized tour of this captivating part of southeastern France taking in some of the best flagship vineyards, staying in sublime Chateaux, enjoying some of the top Michelin starred and Haute Cuisine eateries as well as trying your hand at preparing local delicacies in a private gourmet cooking class. Visit the impressive Roman city of Nimes and fascinating “perched villages” like Gordes. Our tailor-made tours are perfectly adapted to your group size, preferences and timings. 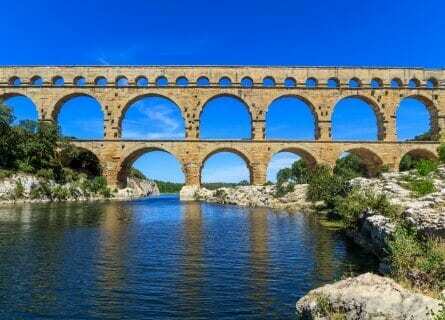 Contact us for more information on this delightful tour of Provence. Your private chauffeur and luxury Mercedes will collect you in Nice this morning. Just a short 20 minute drive to your first private wine tour and tasting at the captivating Château de Bellet. Built around the stunning family Chapel, which draws much-deserved attention to itself, with its elegant white stone from La Turbie. Its beauty and location alone continuing to attract royalty and celebrities as it has done for many years. This is before even mentioning their wines, which are truly spectacular. After a private tour of the wonderful grounds, vines and installations you will sample and savor the sumptuous wines. On to the beautiful hills and time for lunch at Michelin starred Saint Martin. And my what a picture awaits you here; panoramic views over the countryside and sparkling sea of the Côte d’Azur, sit back, relax and tuck into the luscious flavors of the dishes created by Jean-Luc Lefrançois, all perfectly paired with exquisite wines. Such delights might include “Rock Fish with Aspic, French caviar, celeriac, Jerusalem artichoke, verbena emulsion” or “Slow cooked shoulder of lamb with rosemary, tangy turnip, chard “meuniere” and finishing with the most divine patisseries. After lunch enjoy some free time for shopping and strolling in darling artist hamlet of St Paul de Vence. This magnificently preserved medieval hamlet is brimming with art galleries and quirky boutiques. Then on to your sumptuous accommodations, this blissful retreat is the perfect base from where to discover the surrounding area, the delightful Chateau is lost among vines and trees, providing an idyllic haven, enjoy! 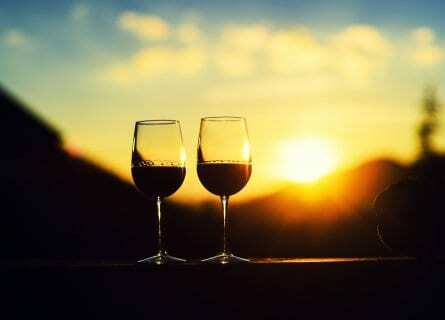 After a relaxing breakfast looking out to the immaculate olive tree-lined vineyards, you will visit the onsite winery. Taste their finest including reds and whites as well as the renowned rosé, shortly followed by another few sips at nearby Domaine Rabiega. Here you will experience some of the best examples of Provençal reds, true finesse in a bottle. Your VIP visit will include a stroll around the stunning grounds, a more homely experience in contrast to the opulent Chateaux, which is exactly what Swedish owner Yves Tanchou aimed to achieve – the pure Provençal experience. Lunch is next, with more fabulous views at Le Relais des Moines. Pretty gardens and terraces and the most delightful dining area of the 16th century stone house set the scene for the out-of-this-world lunch offering which will follow. Husband and wife; Sébastian and Géraldine Sanjou lead the team, preparing impeccable, sophisticated works of art on the plate which lead to the most divine, yet subtle experience on the palate. An outstanding presentation of local cuisine. This afternoon you will have some time to make the most of the terrific facilities at your luxury Chateau hotel. A change of air today, as you will drive a little over an hour west to charmingly beautiful Aix en Provence. You will be totally immersed in the Provence way of life in the hands of your dynamic host and chef, Gilles. Your Provence Gourmet Day experience will start in the market where you will love selecting the best seasonal ingredients for today’s menu. En route to Gille’s fabulous 12-acre property, he will introduce you to his favorite local Château and cheese farm, picking up some essentials for your feast. Once back at the estate and having toured the beautiful home, gardens and “Garigue”, you will set to work to prepare your own typical family cooked lunch, with Gille’s guidance, of course. Then sit back and enjoy your efforts in style with your gregarious host. Some free time follows to make the most of the great shops in Aix. You might like to visit the Cézanne’s art studio too, before in the late afternoon a private tour and tasting at Château La Coste. 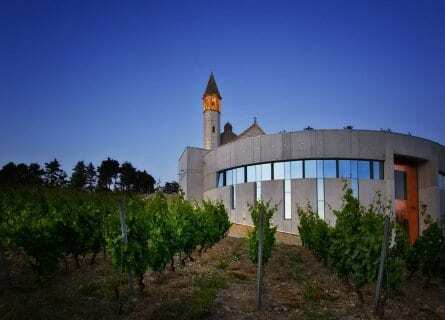 This bewildering wine estate, come art gallery, come architectural phenomenon is owned by an Irish businessman, passionate about contemporary art and architecture who after falling in love with Provence about 15 years ago, went about to create Château La Coste as we find it today. He completely renovated the Chateau and surrounding property, transforming it with the help of his architect and artist friends into a unique art and wine resort. Your chauffeur will then drive you about an hour north to your next abode, the absolutely delightful Hotel Mas des Herbes Blanches. Opened in 1974 and just recently renovated this stunning property is located on the hillside just below the striking town of Gordes. 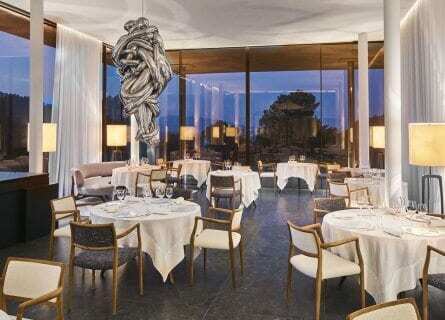 Settle in and freshen up before dinner tonight at their gastronomic and elegant onsite restaurant. Today is a sightseeing and photography day, so don’t forget the camera! In addition to the spectacular countryside and vineyards that you can appreciate right across Provence, the dreamy Luberon region homes the dramatic “perched” hill-top villages and breathtakingly beautiful Gordes is top of the “must see” list. Striking to admire from a distance and as equally fascinating to explore from within, with its meandering cobblestoned alleyways brimming with cafés and art galleries as well as the dramatic castle and church that dominate the views. 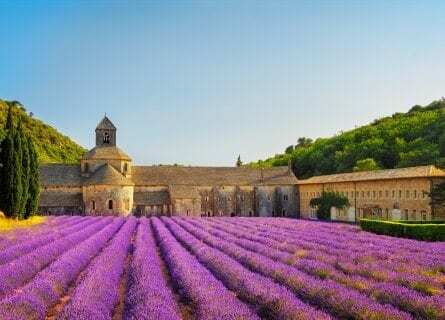 Then on to Notre-Dame de Senanque Abbey, still a Cistercian monastery, dating from 1148, you can, however, visit the grounds and it is here that the quintessential lavender photo is taken. 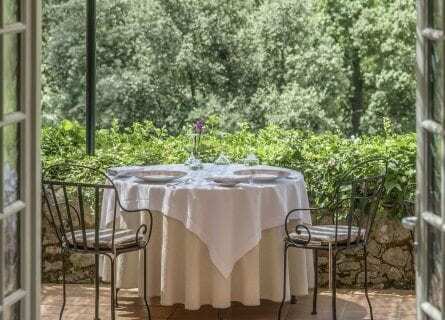 By now you will have undoubtedly worked up an appetite and lunch today is at the fabulous 2 Michelin starred Le Domaine de Capelongue near Bonnieux. Another blow away panoramic view awaits you and the restaurant décor is a perfect harmony between homely and opulent. You will relish the divine creations of head chef and owner Edouard Loubet, accompanied by cracking wines personally selected by the man himself. After lunch, some free time to visit pretty Roussillon, wander around and visit art galleries and cute shops, whilst admiring the awesome views. In contrast the white stone of Gordes, Roussillon is full of color thanks to its location near one of the largest ochre deposits in the world. A late afternoon return to your bewitching hotel, enjoy a free evening to make the most of the facilities and fabulous setting. Incredibly despite the vast quantities of olive trees found, especially in this part of the country, France is not one of the 7 countries responsible for 90% of the world’s olive oil production. This is not to say the quality is lesser, in fact, quite the contrary. Connoisseurs describe the Provençal olive oils in the same way they do fine wine, these olive oils are more a luxury product these days, with Spanish and Italian being used for everyday consumption. This morning you will have the opportunity to decide for yourself at Moulin de Calanquet. A family run estate, now in its fifth generation produce a fabulous range of oils. It is then just a 20-minute drive to the glorious Château Romanin, applying biodynamic viticultural practices and boasting an optimum microclimate, as you will discover for yourself the finished products are fantastic examples of what can be achieved organically and show great finesse. You will then move on to St Rémy de Provence, lunch will be on your own with our tips, and then some free time to explore. This picturesque town is where Van Gogh painted Starry Night and is a charming place to wander around and soak up the Provençal ambiance. Then before heading to your absolutely fabulous countryside hotel, finish the day with a tour and tasting at Mas de la Dame, organically certified and producing some excellent red, white and rosé wines. Caroline Missoffe and Anne Poniatowski are the proud owners of this female lead gem. Once checked in to your hotel, you will have a free early evening to enjoy their world-class spa, before a gourmet dinner onsite at L’Oustau de Baumanière. This two Michelin starred exquisite restaurant is where Head Chef Glenn Viel concocts spectacular dishes, all inspiring, ever-evolving, yet true to tradition, Bon appetite! 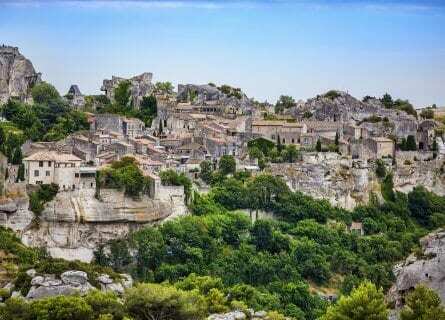 This morning enjoy a little stroll around the tiny hamlet of Les Baux de Provence and then on to Avignon. Here you will have a private guided walking tour taking in the best of this fascinating, heritage-rich city. Highlights include Popes Place, the city gardens, and medieval city walls, finishing with a glass of wine looking out to the Pont d’Avignon. A delightful lunch on the very charming terrace at La Mirande is up next and you can look forward to such tantalizing treats as “Cream of small pumpkin, flavored with citronella and marinated mullet” or “Caramelized sweetbreads with quetsch plum sauce”. After lunch make the most of some free time to get in some shopping and then on the way back to your charming hotel you will stop at the heavenly Château d’Estoublon, the most idyllic setting for a late afternoon wine tasting and stroll around their stunning grounds. Owners Valérie and Rémy Reboul took over the estate a little under 20 years ago and have totally transformed it, carrying out extensive work in both the vineyard and winery. Today will be very much a sightseeing day, so after a leisurely breakfast, your chauffeur will drive you a short 25 minutes to nearby Arles. UNESCO listed in1981 it has some remarkable Roman monuments including the amphitheater, baths, and remains of the Roman circus. However it wasn’t just the Romans who left their mark here, the Renaissance period was very fruitful here and many of the stunning public buildings of today were erected in that time. Arles was also an inspiration for Vincent Van Gogh to whom there are many tributes around the city. Lunch will follow at La Chassagnette, a fascinating concept having its own kitchen garden just a few meters away from the kitchen door, where most of the vegetables and fruits are organically grown and picked at optimum ripeness moments before being served. Head Chef Armand Arnal has no set menu and his daily creations are inspired by the day’s harvest, truly inspirational. You will then spend the afternoon in Roman Nîmes, its impressive arena once seating tens of thousands for gladiator fights, these days is used as a bullring and the annual Roman games. For a more modern contrast, Nimes also houses the Carrée d’Art designed by British architect Norman Foster which is home to the Musée d’Art Contemporain and has a good collection of French and western European contemporary art. Other highlights include the Maison Carrée, the splendid limestone Temple dating back to around 5AD and the striking Eglise St-Baudille neogothic style church. Then a free evening to make the most of your last night at this fabulous resort. See you again soon, Au Revoir! After a last breakfast at your supremely romantic hotel, carry on to your next port of call (Marseille or Nice airport). Bon voyage!